Today’s first goal was to visit a grocery store. With a little help from Google, we found a Kaiser Supermarket inside the Mall of Berlin. We bought pretzel-sandwiches from the deli for breakfast. The sandwich had some sort of chivey cream cheese which was especially tasty. We washed down our food with juice that tasted like straight-up liquified applepie. It was great. Afterwards, we wandered around the store and picked up pretty much every sweet thing they had to offer: Ritter Sport candy bars, Christmas cake, Haribo candy, and Kinder chocolate. We also grabbed a pack of Berliner Weisse. Berliner Weisse is a light, sour beer from Northern Germany. In order to combat some of the sourness it’s usually mixed with a sweet syrup. There were two choices of Berliner Weisse at the store, red or green; but since we can’t read German, we didn’t know what the actual flavors were. I suggested we buy pink because in my experience green flavors aren’t usually very good. We found out later that the green beer is flavored with woodruff, a hallucinogenic flower (it loses its powers when mixed with alcohol) that doesn’t taste very good. It seems I made the right choice. After we dropped our goodies off at the hotel, we headed back out to catch a free tour of the city. We met our group in front of the Brandenburg Gate on the Pariser Platz. Our guide, Sadie, was an ex-pat from England, with a degree in German history, who moved to Berlin during her quarter-life crises, got knocked-up by a German dude, and now makes a living giving tours. She was pretty cool. In addition to the Brandenburg Gate, the Pariser Platz is also home to the American embassy, several banks, and the Adlon Hotel. 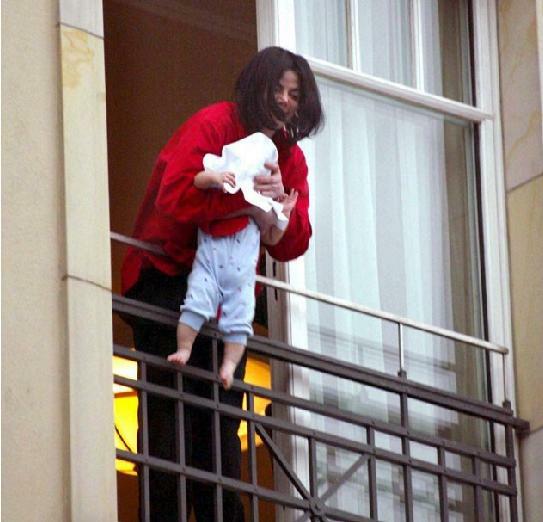 The hotel is well-known not only for its long history (it opened in 1907), but also because it’s where Michael Jackson dangled his son, Blanket, out of the window. Good work Michael. Sadie also taught me some fun facts about the Brandenburg gate. My favorite was that the statue on top was taken by Napoleon during the Napoleonic Wars in 1806 and put in the Louvre. When the German’s finally got the sculpture back in 1814, they renamed the goddess Victoria. Our next stop was the Memorial to the Murdered Jews of Europe. The memorial consists of over 2,000 big, gray, stone blocks. The artist, Peter Eisenman, has suggested that the blocks are supposed to lead viewers to feel disoriented and confused. As you walk through the blocks, the ground is uneven and you eventually lose sight of the city. Adding to my disorientation and confusion, John kept hiding behind the blocks, so I couldn’t find him. Lovely. So, so fun. I think I’ll teach this to my kids when we return to school. We walked a few more blocks and found ourselves outside a big, gray, imposing building - The Reich Air Ministry. When it was originally built in 1935 by the Nazis, it was the largest office building in Europe. Somewhat surprisingly it wasn’t hurt during the war. When the Soviets moved in, the building became the Ministry of Ministries. (Sounds like something from Harry Potter.) On the outside of the building, the Soviets added a large mural depicting East-Berlin workers loving their lives. Propaganda at its finest. The mural is now juxtaposed with a similarly sized photograph of the 1953 workers’ protest. The building now houses the German Finance Ministry. The largest captive balloon in the world! After recharging with apfelstrudel and gluhwein, we continued the tour near the Berlin Wall. We heard some fun stories about people escaping to West Berlin. The best was a man who built a hot-air balloon in his attic, set off from his roof, and sailed over the wall. Another great story was a man who set up a zip-line from the top of his office building and zipped, with his family, across the wall. We also passed by Checkpoint Charlie. There were some goofy guys there dressed as American soldiers. There were some equally goofy tourists paying two dollars for a picture with them. We continued walking and ended at Babelplatz the site of the 1933 Nazi book burning. If you look through a slab of glass in the middle of the square, you can see a room full of empty bookshelves. This is to represent the books burned by the Nazi’s in 1933. After our museum visit, we needed something a bit cheerier, so we headed back towards the Christmas market. Along the way we popped into a fancy chocolate store. They had these amazingly huge chocolate sculptures of everything from the Brandenburg Gate to nutcrackers. John wouldn’t let me buy anything (womp womp), but seeing the statues was worth the torture. We eventually made it to the Gendarmenmarkt Christmas market. The main purpose of this brief jaunt to Germany was to visit the Christmas markets, so I was pretty excited. I’d say it lived up to the hype. The booths were festively topped with yellow stars and draped with lit garlands along the sides. The market was especially magical because of the buildings, the churches and concert hall, that flanked the sides of the market. Of course, our first stop was for gluhwein. As we sipped our drinks, we meandered through the stands. People were selling everything from fancy soap, to marzipan pigs, to wool hats and gloves. There were also tons of food and drink booths. John bought some pretty epic potatoes. There were covered in fancy melted cheese and bacon bits. Once the potatoes were gone, we bought a delicious cheesy pretzel which we washed down with spiked apple cider. Yum. Next we checked out the entertainment. It was a pretty awful. You can watch the lead singer in this promotional video for the Christmas market. We ended our visit to the market with hot chocolate and a bratwurst. On the walk back to the hotel, we passed the Ampelmann store. The Ampelmann is the little guy on the Berlin walk-signals. The Ampelmann was featured on everything from shirts, to lunchboxes, to gummy bears. We bought a little Ampelmann Christmas ornament to add to our tree. What a lovely ending to a very German day!